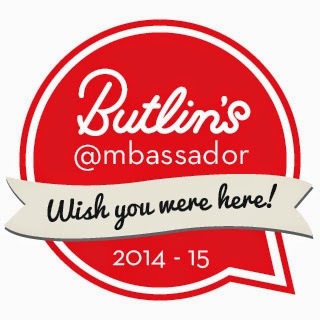 We are so excited to be one of ten bloggers chosen to be a Butlin's Ambassador this year. Readers of our blog will know that we love a staycation and we can't wait to share with you everything we learn about Butlin's and the fun they provide for the whole family. You will notice I have a lovely new Butlin's badge on my sidebar and a Butlin's tab at the top of my blog - this is where you will find all of my Butlin's reviews, guides, top tips, news and videos throughout the year in one easy to find place. As Ambassador's we are going to visit Bognor Regis in October half term and Skegness next Summer. We are all booked up to stay in the Waves Hotel at Bognor and I literally can't wait. 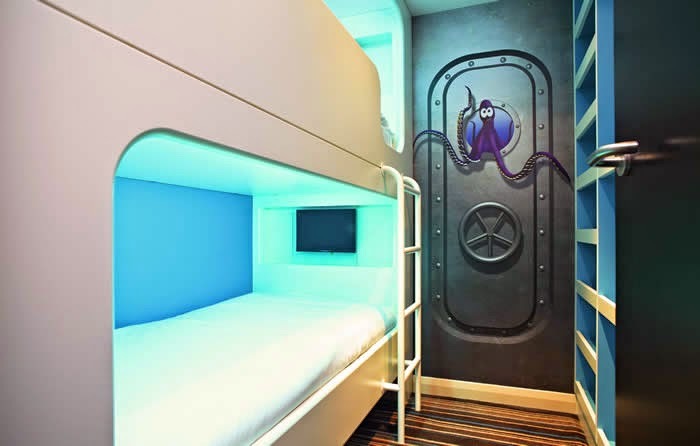 The boys are going to love these under the sea bedrooms complete with an integrated tv at the bottom of each bed (and ear phone sockets next to their pillow). There is a wealth of information to get us excited on the Bognor Regis resort homepage and I have been scouring the internet for the blogs of past ambassadors for top tips and to give us an idea of what to expect. This Butlin's linky from ChelseaMamma is my new favourite reading material and I particularly love this Wave Hotel review from OneDad3Girls. Exciting!!!!! We have actually been to Butlin's Skegness twice before when Harry and Heidi were pre-schoolers. We absolutely loved it then - the hassle free dining, free fairground rides and jam-packed entertainment schedule with characters they loved all contributed to two excellent breaks. Now that our family has grown, I am really looking forward to trying some new activities. These discovery studio shows look fantastic and I will definitely be taking Harry along to Inventive Science. Angelina Ballerina is one of Heidi's favourite tv characters and I know she will love taking part in Angelina's Ballet School and as we all know, Jack is Thomas-mad so will be super excited to watch the Thomas and friends show. Mister Maker, Cirque du Hilarious and Superslam wrestling are just some of the things the whole family are looking forward to and personally, I cannot wait to leave the kids at the scoop ice cream parlour with dad and escape to the Ocean Spa for a few hours. It looks like some sort of heaven! I have so much I want to write about Butlin's already! I aim to provide as much information and helpful guides as I can throughout my Ambassador role so if you would like me to cover any specific part of a Butlin's break, please do let me know.